BRING THE F1 PARTY ON! Back for its tenth run since the inaugural night race in 2008, the Singapore Grand Prix still remains one of the most exciting events on the F1 calendar. With Lewis Hamilton (Mercedes) and Sebastian Vettel (Ferrari) neck-to-neck at their current standings, the Singapore leg of Formula One (F1) is undoubtedly one to watch. This year, two of our concepts will be participating as part of the F&B vendors in the Grand Prix event. Join in the fun with Nam Nam Noodle Bar as they serve pho-tastic meals at the Padang, alongside with headlining acts like Jay Chou, The Killers, Liam Gallagher, Dua Lipa and many more. 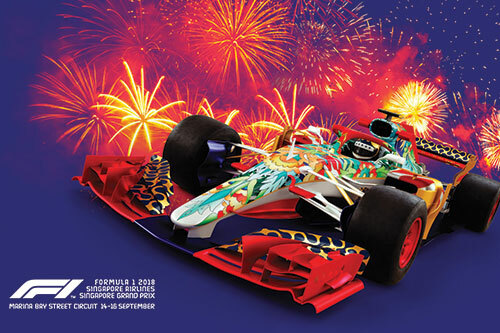 Guests who are part of the Singapore Formula One Paddock Club™ can look forward to our assortment of artisanal tarts and other confectionaries by Tarte by Cheryl Koh while overlooking an unparalleled view of the pit crew in action, as well as the spectacular race to the finish line. With all the breakneck speeds, the relentless cheers, the electrifying atmosphere, after-parties – how will you be enjoying the Singapore Grand Prix?